Through Art for The Journey, a Richmond based nonprofit, I provide adult (15 years old and up) studio classes and intensive workshops, including day-long plein air experiences in and around Richmond, VA and in Swan Quarter, NC. 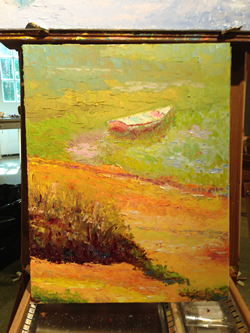 As adjunct faculty at the Virginia Museum of Fine Arts Studio School I provide workshops in Impressionism at the Studio School. You can visit the VMFA Studio School and browse its catalogue here. Studio classes are scheduled in six week sessions and cost $240, which includes all materials. The day long workshops cost $75, including materials. Once you purchase a six week session those weeks are yours until you use them. If there is a break in your attendance you simply pick up where you left off when you come again. You can start at any time. In order to make the wonderful experience of painting available to as many people as possible, We offer to provide all the materials, including French Easels, paint, palettes, canvas and even paper towels. All you need do is show up ready to enjoy the experience. You can visit the Classes Any Time - there's plenty of room to sit and observe, ask questions and chat. Just let us know when you'd like to come by. Monday Studio Classes are 1:30 to 4 p.m. at Art for The Journey's Independence Golf Club studio and Tuesday Studio Classes 6:30 to 9 p.m. at Mark's West End studio. Summer camps for children are available through Art for The Journey. Check this link for more information. Generally the 3rd Saturday of the Month - 9:30 a.m. to 4:30 p.m. Cost is $75 per session. All materials provided, including French Easels. Lunch will be own your own. Must sign up two weeks ahead of workshop. Sessions will be outdoors, weather permitting, or at the studio. Depending on the weather, the Swan Quarter workshops are either indoors at the Mattie Arst Center or outdoors at a variety of sites around Hyde County and Lake Mattamuskeet for landscape/waterscape painting. These generally take place on the third Saturday of the month. Swan Quarter and Hyde County -	enjoy this video about Lake Mattamuskeet and Swan Quarter. Feel free to contact me for information. 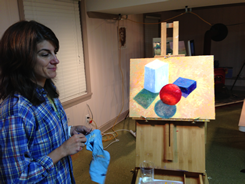 Color Studies provide a simple and easy introduction to impressionist painting. The purpose of a color study is to open the eyes of students to the color that is all around us. If you can't see the color you can't paint it. Claude Monet spent many years developing his color perception. These exercises do just this. For beginning art students this can be an easy way to learn. For more advanced painters it is a great way to sharpen one's color sense. How hard is it to draw a block? Jamie Wigginton talks about her experience in the classes: "Not only is Mark a truly gifted artist and teacher, he is wonderful person as well. He shares his talents in such a humble, helpful way that each student feels comfortable and accomplished, no matter their skill level. Mark keeps his classes very small which allows him to give a lot of individual attention and adapt instruction based on each student’s needs. I have been in class with several people who have had no prior art training and just want to try something new. Mark provides a non-threatening environment where these artists can learn, but he also helps propel experienced students to the next level. I love attending Mark’s class because not only do I learn a great deal, but I meet new people, we encourage each other, and I don’t think about anything else except the painting in front of me while there. From first time artists to very experienced painters, there is a place for everyone in his class." 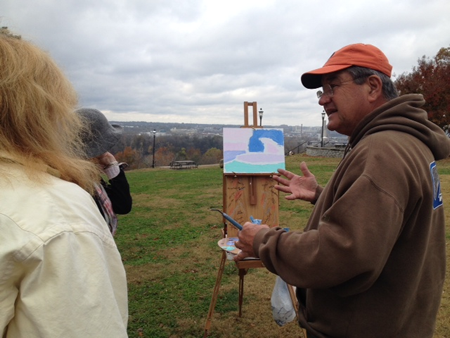 The view over the James River from Church Hill's Libby Terrace is a popular location for plein air artists in Richmond. This late Fall workshop gave students an opportunity to choose from a number of beautiful views of Richmond, the river and Chesterfield County. This day-long experience included a lovely lunch at one of the resident's homes. 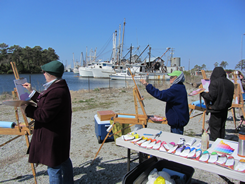 Fishing Boats, are a favorite subject for plein air sessions in Swan Quarter. This was a spring session that included participants from Hyde County and Richmond. This day-long experience was followed by a seafood feast at the business of one of the Hyde County artists. Benedicte Whitworth talks about the class experience: "I have taken four sessions of Mark's classes. Each one has been a wonderful journey of discovery. Mark was extremely patient and supportive even though the beginning was really hard because I did not have much confidence in my abilities. Mark taught me to let go of my fears. 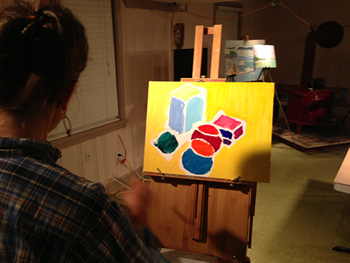 I get totally engrossed in what I am painting and now dare to think outside of the box. I asked a few friends to join the class so, not only do we enjoy painting, but we have lots of fun as well. It is extremely relaxing."